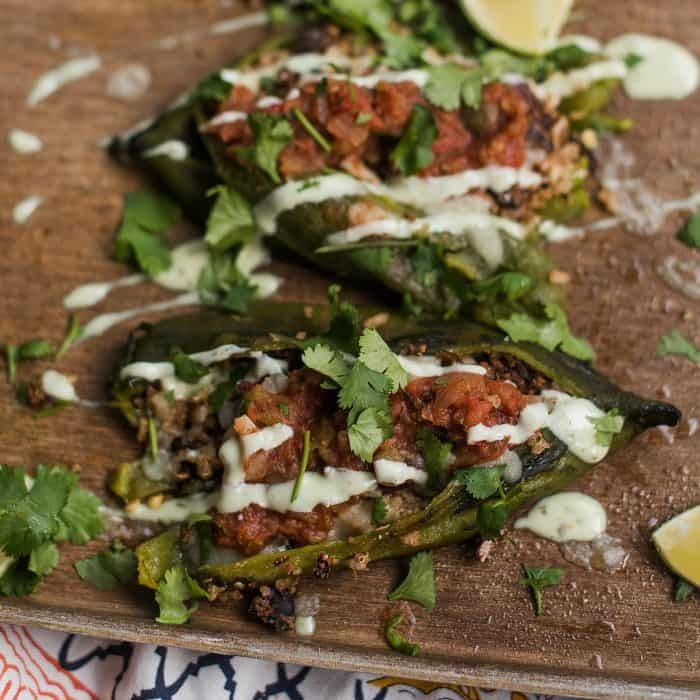 These Stuffed Poblano Peppers with Spanish Style Rice are a delicious weeknight recipe, peppers baked and filled with Mexican style rice and homemade refried beans. 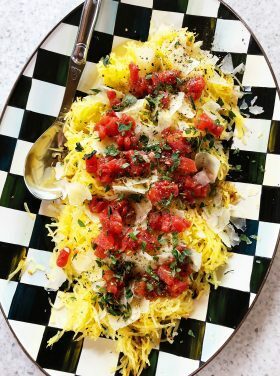 Top with fresh cilantro and serve! Friends, one thing my sisters and I have learned is to not say, someday. “Someday” is filled with promises and intent. It’s easy to talk about doing something, but until you actually do it, it can be a distant cloud. Make things happen today. I guess this might be the opposite of procrastination, which can also really hurt relationships with others. 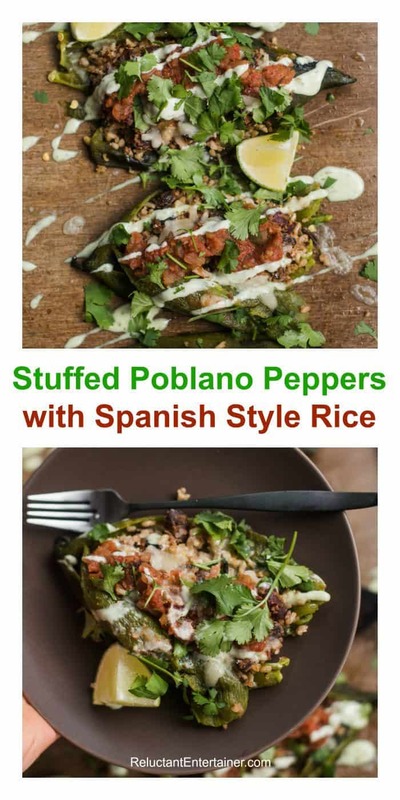 First, this Stuffed Poblano Peppers with Spanish Style Rice recipe that I’m sharing today I’m super excited about. 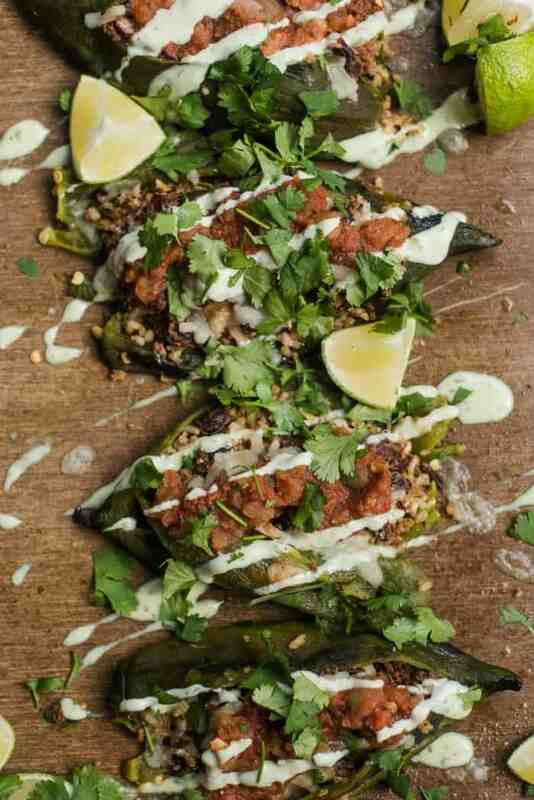 A spin on the classic stuffed peppers, these are cooked Mexican style and so good! 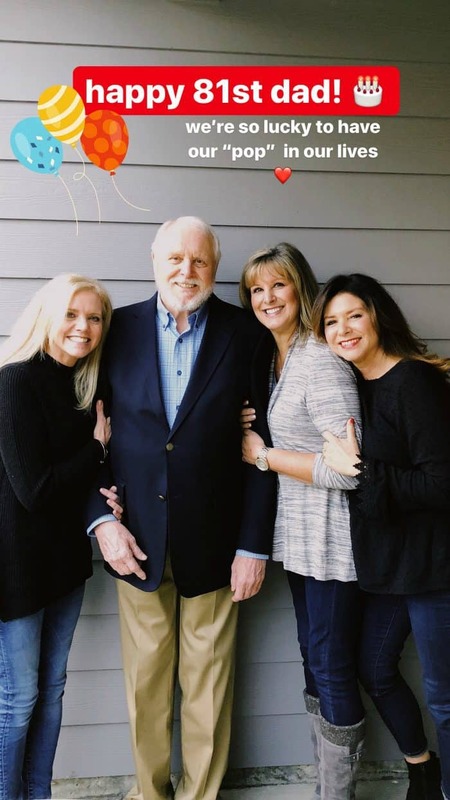 I was lucky to be back home for my dad’s birthday a couple weeks ago, hanging out with my sisters! We’re also planners, so when we set our minds to it, we have planned a lot of meals together and trips here and there. 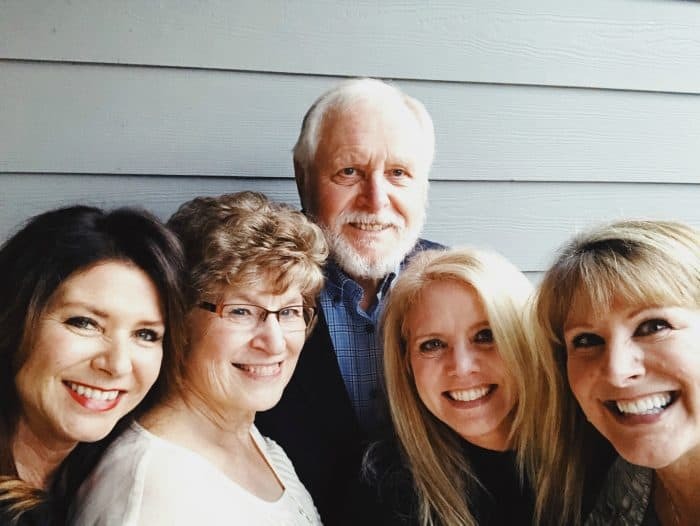 Going home is a true blessing, just to be together with family, and we were fortunate to have several meals together with just our dad and his wife, Ginny. Leaving our “guys” home, it was just Dad and all his girls. A very special treat. One recipe that I’ll always think of, when growing up, is my mom’s stuffed peppers. All 3 of us girls learned how to make them. Not always a favorite, because the green peppers were so bitter, but I scoop out and eat the rice mixture inside, and leave the pepper on the plate. 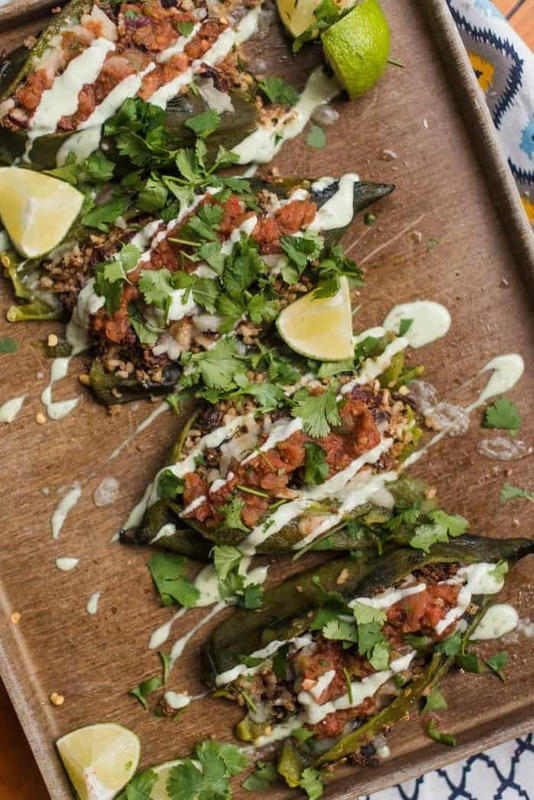 With this recipe today, Stuffed Poblano Peppers with Spanish Style Rice, made with our favorite poblano peppers, you will want to devour the whole meal! So scrumptious, stuffed with a Spanish style rice, and homemade healthy refried beans. Did you know that you can make your own refried beans? Take your favorite beans and mash, adding delicious spices. 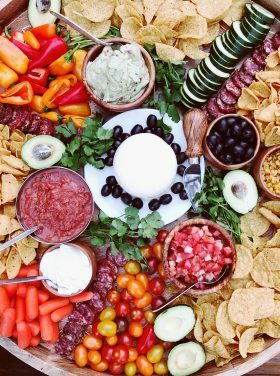 Follow the recipe, and don’t forget cilantro and fresh lime for garnish! Maybe you’re thinking of some people you “should” have over for dinner. Instead of “someday,” make that invite! Lightly oil the bottom of rice cooker before adding in 2 c water and 1 1/2 c rice. When rice is cooked, add in salt to taste, cinnamon, cayenne, cumin, and garlic powder, then set aside. In sauce pan, heat 1/4 c oil. When hot, add beans and begin to stir and mash. When light mashed, add in the spices: garlic powder, chili powder, cinnamon cumin, and salt. Once beans are mashed and hot, turn heat down to low to keep warm. Place peppers on baking sheet. Coat in oil and broil for 2-4 minutes each side (making sure the skin blisters and chars slightly, but does not burn). Flip pepper a couple of times to cook all the way around. Remove from oven and allow to cool. Once cool, twist stems carefully and pull out the seeds. Then, without tearing the pepper, remove any excess seeds from the inside via the top hole. Peel the thin outside layer off the pepper until only the green meaty part is left. Be careful to not rip the pepper—try to keep them whole. Make a slit about halfway down the pepper, making sure to only cut one side (not all the way through). Stuff peppers with rice and beans, then sprinkle the cheese on top. Cook at 375 degrees for 5-7 minutes. Remove from oven and top with salsa, cilantro dressing, fresh lime, and fresh cilantro. 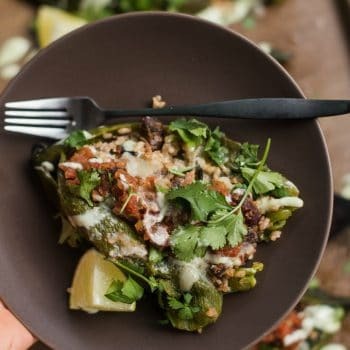 More stuffed poblano recipes: Pressure Cooker (Instant Pot) Poblano Corn Chowder [Pressure Cooking Today], Cheesy Stuffed Poblanos with Ground Turkey [Kalyn’s Kitchen], Poblano White Bean Chili Recipe [She Wears Many Hats], and Vegetarian Zucchini Corn Chili (Summer Chili!) [RE]. This recipe is on my short menu list, Sandy, thank you!! 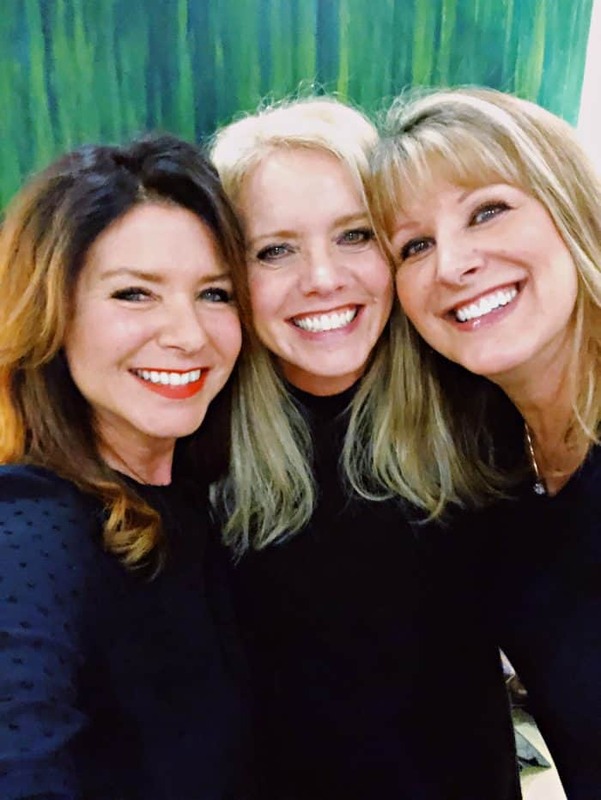 You and your sisters are so beautiful. It makes me crave a girls’ trip with my own sisters. And what a top putting off the important things, the good intentions. 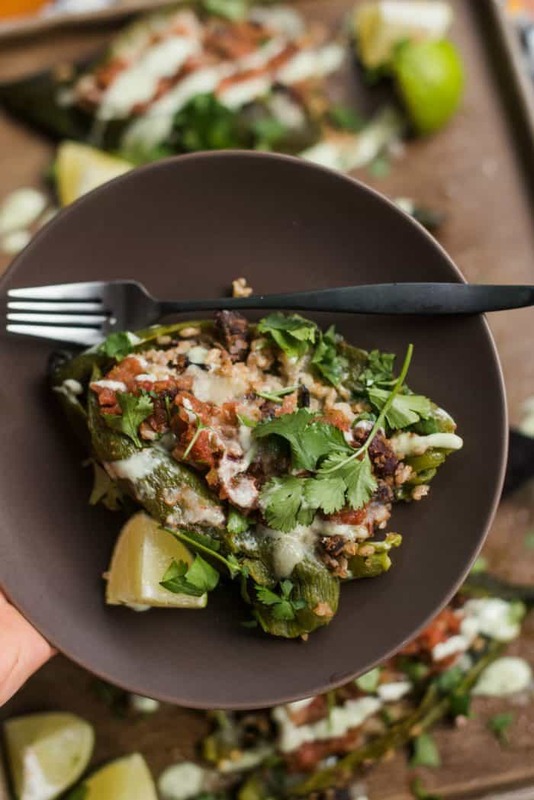 What a great way to change up stuffed peppers. 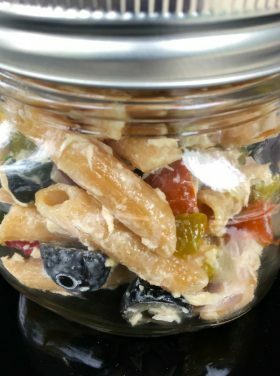 Thanks for linking to my poblano recipe! Oh, such beautiful pictures, Sandy!